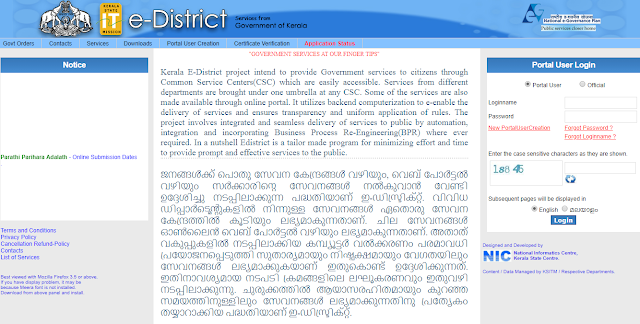 Services provided in e-District Portal Kerala? How to apply for a certificate in Village / Taluk Office Online in e-District Portal? Applicant have to visit the website https://edistrict.kerala.gov.in/ and Register themselves only by clicking on New Portal User Creation if not Registered already. If already Registered Applicant can Login using Login Name and Password. Select the Radio Button Portal User while Login. Fill the Online Application Form and Enter the Aadhaar Number and click on Validate to Validate the Aadhaar Number and you Enter the captcha and click on Register once Aadhaar is Validated. Once successfully registered you can Login using your Loginname and Password and click on Login. Click on Applicant Registration under One Time Registration and Fill the Application Form and click on Submit before applying for a certificate. From your user account you can apply for a certificate for you, your family members and others also. Maximum 10 applications can be submitted in a month. How to check Application Status once applied? For Water, Electricity, Land phone, Mobile phone, Wireless connection bill payment please select the link under payment services.